Anyone who’s been through our Accelerator knows there’s one word I say more than any other throughout the 30-day program: it’s “outreach”. Build relationships to build your business, it’s honestly that simple. In this episode, we have someone who exemplifies outreach, Andy Storch. In 2018 he attended over 8 conferences to build relationships for his business. 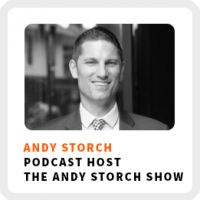 I actually first met Andy as part of my outreach habit when I suggested coming on his podcast, The Andy Storch Show. A few days later, I attend the Podcast Movement conference and who comes walking up to me, but Andy! We had no idea we’d both be there, but as you develop your niche tribe of relationships, serendipitous encounters like that become more common! Why attending conferences is Andy’s preferred method of making connections. Find out what you like to do by first finding out what you don’t like to do. View jobs as apprenticeships for new skills you want to acquire. Andy offers some advice to introverts on how to make conferences work for them. Core work activities + habits: 1) Connecting with prospective clients. 2) Building relationships with partners, current clients, and potential clients. 3) Posting lots of content to Facebook and LinkedIn. Ideal work environment: From his home office, where he has a quiet room to work and can still access what he needs in his house. Regains focus by: Connecting back to his goals and connecting with friends or accountability partners. 1) Network with other people by standing around in the hallway, particularly if some of the sessions don’t interest you. 2) Start by approaching people who aren’t talking to anybody else and eating meals with people. 3) You’re far more likely to remember the people you met as opposed to the content of a conference.